Excerpt from U.S. Coast Guard “Proceedings of the Marine Safety & Security Council” magazine by LCDR Richter Tipton and CAPT Gerald Swanson, U.S. Coast Guard Activities Far East. U.S. Coast Guard Activities Far East (FEACT) is a forward-deployed Coast Guard operational command responsible for Coast Guard missions across the Asia-Pacific region. Stretching from Russia to New Zealand, and from Madagascar to French Polynesia, this area of responsibility contains the world’s largest commercial ports and strategically important shipping routes, as well as the maritime industry’s largest shipbuilding and repair centers. FEACT executes the Coast Guard’s International Port Security and marine safety (inspection/certification/casualty investigation) program for all U.S. flag vessels operating in the region, including the U.S. Navy’s Military Sealift Command fleet. Additionally, the response/security department operates a team of 10 international port security liaison officers spread across the Japan, Singapore, and Seoul offices. The logistics department deals with issues unique to overseas missions such as obtaining visas and clearance approvals for international travel, specialized training for foreign deployment, protocol with industry and government officials, and maintaining critical relationships with our Department of Defense, the U.S. Embassy, and foreign nation hosts. One aspect of the FEACT mission is the sheer number of cultures and various customs and traditions we encounter. To be successful, officers must be familiar with the cultures of all the countries they visit. One week you might be greeting a Fijian with a hearty “Bula,” and the next week it’s “Annyong haseyo” in Korea. In one country you might shake hands, while in another it is only culturally proper to bow. Keeping it all straight can be complicated, but getting it wrong may undermine the success of the mission. In several of the FEACT countries, the Coast Guard officer might be one of the few Americans the locals ever see, so it’s important to leave a good impression. Solid understanding of the country’s culture and the ability to identify critical factors help each of our members avoid cultural pitfalls. Because of FEACT’s close, long-standing relationships in our Asia-Pacific region, we find ourselves in a good position to help the Coast Guard and Department of Homeland Security move forward with a consolidated and comprehensive international engagement strategy for the region. 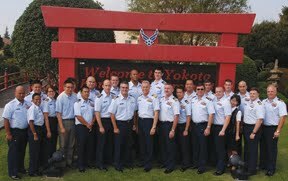 Photo 1: Coast Guard Activities Far East staff gathers in Japan for annual training and orientation. 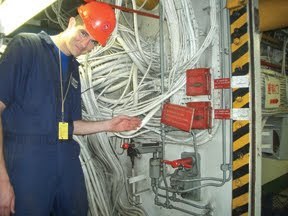 Photo 2: LT Ken McCain of FEACT’s prevention department often flies thousands of miles to inspect vessels in other countries. Photo 3: CDR Yuri Graves of FEACT’s security department, right, visits a foreign port as the international port security liaison officer. 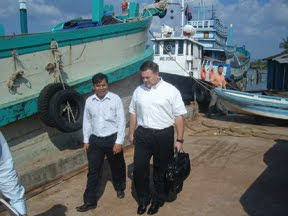 FEACT’s liaison officers make dozens of country visits per year, covering 105 million square miles of the Asia-Pacific region. 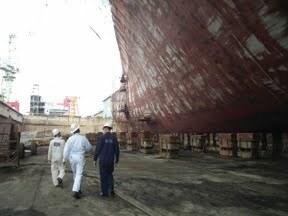 Photo 4: FEACT’s prevention department staff inspects a dry dock facility in the Asia-Pacific region. Photo 5: Proliferation Security Initiative 2007 exercise at Yokosuka, Japan. 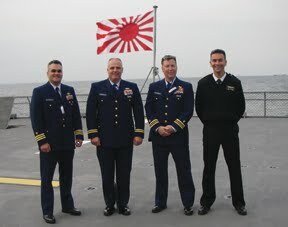 The U.S. officers (from left) CDR Mark Eyler, LT Gregg Maye, LCDR Rich Kavanaugh, and LCDR Wes Bringham, USN, demonstrated how the USCG and USN work together during joint operations aboard a Japanese Maritime Self Defense Force ship. Interesting article and photos - good site, thanks.